Cleveland contacted us last week in regards to having a website made for his new church that he was starting – Hebrew Christian Church. Cleveland’s budget was pretty minimal, so we explained to him that we could start off with a basic website and then increase the capabilities and functionality of the site down the road. He agreed that this was the best option to at least get a website started for his church. He also noted that they needed to have a professional logo designed that they could use on any kind of printed materials. He gave us a rough sketch of what he wanted. Our graphic designer completed this logo perfectly to Cleveland’s expectations a few days ago. We want to thank Cleveland for providing us the business with creating a church website design for him! 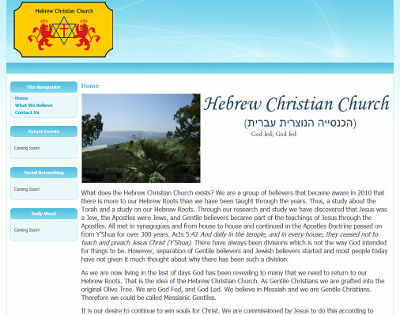 The Hebrew Christian Church website is at hebrewchristianchurch.org.